A man of obvious breeding and station comes to a French circus, pitched just outside of Paris, applying to be a clown. Although he has no experience as any kind of entertainer, he is accepted. Probably because he agrees to work without any pay. The man, who will dub his clown persona He and make He’s act one in which he is constantly slapped, becomes a (no pun intended) hit. Other clowns and circus denizens report with amazement and glee how many times in a single performance He was slapped across the face. The number climbs to more than 100 per show, but He, played as a happily masochistic Pierrot by the excellent Ross Beschler, marks each new record of assault and humiliation with joyful celebration, stoic acceptance, and a big wide toothy grin accompanied by a deep, self-consciously sinister laugh, his face looking like a handsomer, less made-up version of the clown used in logos for Steel Pier and other amusement parks and carnivals.
. The lives up to his stage billing, He Who Gets Slapped, and revels in his circus life while harboring both romantic affection for another performer and a secret that gives an air of mystery about his actual identity and reason for wanting to spend his days being publically degraded. It’s one thing for Beschler to play at mystery. He does it well, as he assays all aspects of his complex, complicated character. It’s another for either Philadelphia Artists’ Collective director Damon Bonetti or playwright Leonid Andreyev’s adaptor, Walter Wykes, to create a mystery that mars “He Who Gets Slapped” and keeps it from gaining dramatic footing, let alone traction. I’ve only encountered Andreyev’s play once before (besides reading it). Actually, I did not see a play. I saw a silent movie starring Lon Chaney while I was a student at Temple University in an earlier century. Time has passed, but I remember a context for He wanting to be humiliated and slapped as a kind of penance and indulgence in abandoned self-esteem. His retreat to the circus comes after a baron, with the help of He’s wife, takes credit for a monumental achievement, I believe a scientific achievement, that was entirely He’s doing. When the baron basks in the accolades of the Académie Française for his discovery, the man who becomes He interrupts the ceremonies and protests the breakthrough and the honors attending belong to him, for which alleged insolence the baron slaps him. See how symbolic the slap in this scenario? See how a man with a wry, self-effacing sense of humor could turn an act of personal disgrace and horror into a circus routine? Knowing this cements, and makes comic, ironic, and even poignant the daily battering He’s face takes. Except Bonetti’s production has no such context. It begins with actors, trained in clown skills by the Philadelphia School of Circus Arts, tumbling in and doing all kinds of acrobatic moves and demonstrations of strength to establish a circus atmosphere and set an antic tone. By the time the deft Ben Grinberg, Terry Brennan, Andalyn Young, and josh Totora complete their three-ring hijinks, He is on hand offering his services. There’s no preamble supplying exposition and texture, just a nobleman asking, for private reasons, to have a job and choosing to play a clown who gets clobbered by his dell’arte-like colleagues at every convenient moment. 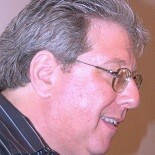 Beschler smiles like a combination of the Mad Hatter and the Cheshire Cat when he is hit on stage or mishap strikes backstage. But when he is slapped for real, by a baron in Wykes’s script or the woman for whom he pines, Beschler makes He look angry, sad, grim, and vengeful in turn. As a character performing an act, He can take all abuse heaped of him. Makeup off and dealing with an actual world of betrayal and delusion, he reacts with wrathful irritation and looks to be arrested in a livid rage. Something is obviously eating at him and influencing his reaction, but we don’t know what that might be. Beschler does fine, but either Bonetti or Wykes, or both, doesn’t provide the background we need to make logical sense of He’s story and appreciate it for all of its meaning or depth. Continuity is missing. PAC’s “He Who Gets Slapped” seems to start in medias res. It edits or omits crucial bits of information. In Bonetti’s production, He seems to be a total eccentric who wants to escape reality and go on the road for its own sake. He has a lunatic side that prompts him to suggest a gimmick that leads to him getting hurt for the amusement of others. He has no underpinnings that create tension or dramatic irony. He’s an anomaly, and while we can occupy ourselves with wondering what makes He tick, we develop no sympathy or feeling for him. Even the adroit Beschler cannot defeat this. His performance is detailed and even majestic, but there’s nothing about He to draw us to him and to regard him as a hero, or even as someone to pity or want to help. A strongman and equestrian specialist, Bezano, is much more commanding of our attention. Another clown, Jackson, is much more entertaining. Even He’s love for Bezano’s show partner, Consuelo, another horseback acrobat, is not affecting despite the sadness his makeup gives He’s mourning eyes. Consuelo is sought by two others, one a villain, a baron who has the approval of her avaricious amoral father, and Bezano, whom the audience can see is the worthiest suitor and the woman’s choice. He (the clown He) can gain Consuelo’s respect, but the others have a better bead or her hand and heart. That could be enough of a plot, Pierrot never being able to become more than a friend of confidante to his desired Pierette, or Consuelo having to select among three ardent, persistent wooers, but these are not the main story of Andreyev’s play or Wykes’s adaptation of it. Finding out the identity and motives of He is. You want to forgo some history and foreshadowing? Fine. But keep the mystery about He’s actual motives on the audience’s mind. Make it a source of unquenchable curiosity. Enhance one melodrama, the one surrounding Consuelo, with a more potent and engaging one, slow and clear revelation of He’s choices. Wykes fumbles the main chance by never bothering to present or accent He’s back story. Bonetti follows Andreyev’s scribe into the rabbit hole by not establishing the significance of the slap in He’s life, and psyche. “He Who Gets Slapped” gets performed in a vacuum. Even when some elements of He’s past promise to come to light, an opaquely dense scene with a barely identified stranger makes everything foggier and cloyingly more confusing. Wykes and Bonetti can’t even get a potentially interesting sequence in which He simultaneously and complexly plays a heroic meddler and jealous rival trying to ascertain the baron’s feelings towards Consuelo and to dissuade him from continuing his suit. His passage leads to He and the baron dancing an entertaining but enigmatic tango that has some theatrical panache and tickles the funnybone but it doesn’t become untangle any plot intricacies or establish even a dramatic relationship between the two characters. In fact, it becomes one more instance of seemingly random plotting that doesn’t mesh or link with anything except the matter of Consuelo’s affections and the marriage she’s likely to enter in spite of them. There’s nothing to seize on in this script or Bonetti’s staging of it. Inconsistent acting doesn’t help — Beschler is almost alone in giving you someone of substance to watch — and the inconsistent stereotypical romantic plot lines are downright crippling. Wykes doesn’t give Bonetti an inch of room on which to build anything involving. We’re left with a mediocre melodrama concerning the less than uninteresting Consuelo and an unsatisfied curiosity about He and the cause of his retreat from society. Yes, He has a confrontation about a literary matter, a manuscript filched rather than a scientific triumph, in this rendition. An unfaithful wife, and eventually unfaithful mistress, is mentioned, but unless you have some grounding, as I did from the Chaney silent, these factors come from left field, if not thin air, and have no resonance or seeming dramatic purpose. The other party in this contretemps isn’t even the baron. It’s that stranger who materializes from nowhere — thin air again — to provide a lame, practically incomprehensible explanation and lamer denouement. Even if the sequence between He and the stranger registered in an important or structurally cohesive way, the passage would reveal too little and come too late. Wykes and Bonetti leave us in the dark from the start. They give the impression Andreyev’s play is about the tawdrily venal contest to see who received the hand of Consuelo. It that’s the main plot line, why is He given the bulk of stage time and presented and portrayed as such a human riddle, and why is Consuelo, especially as assayed by Isabella Fehlandt, such an unfaceted cipher who in no way conveys she is a woman of fascination that can earn the ardent admiration of three worldly men? Again, the play is called “He Who Gets Slapped,” not “She Who Goes to the Highest Bidder.” Wykes and Bonetti focus on Consuelo, possibly the least enticing, least interesting character in the play, and certainly in this production of it. (She shouldn’t be, but she is!) Wykes and Bonetti relegate He to the role of the bystander who gets involved in the personal lives of his circus colleagues as an observer who feels he has to step in when he sees shame and danger coming to a young woman, an impulse that becomes more complicated when he falls in love with her even knowing her affections have been captured by Bezano. The PAC staging is skewed where it shouldn’t be. A subplot has usurped the main story and left Andreyev’s work simplistic, and disjointed, and devoid of texture. I never found Bonetti’s production boring — Too much is going on to make one critically curious about why — but from the beginning, I thought it misguided, unnecessarily confusing, and more concerned with style, and circus antics, than substance. Only the Pagliacci-like laughter of Beschler’s He, often pealing out at unexpected or inopportune moments, sometimes being a poignant commentary on the absurdity of the situations we create for ourselves, gives Bonetti’s show any weight. He abandons He to concentrate on Consuelo, and the folly of that is Consuelo never commands our attention, and Fehlandt never endows her with anything the least attractive, let alone mesmerizing. Fehlandt’s Consuelo is an unformed lump with no posture or poise. She doesn’t even have the stature of an equestrian or the bearing of a talented athlete. It’s difficult to see the allure that turns three heads. Fehlandt, who I’ve seen shine, has no presence in this role. Her voice is not suited to the tone and classic nature of the dialogue. It’s contemporary, flat, and without tone. Her facial expression is more than young, it’s immature and uncomprehending even though Consuelo’s lines make it clear she’s no innocent, understands what’s going on regarding her, and is willing to play the most adult and cynical of games. No grown man could see anything of value in this vapid Consuelo whose looks and action defy the dialogue I just cited. Maybe Bezano, from working with her, sees a spark of potential that can grow, but one would be hard out to see how or why Consuelo appeals to the baron or to He. Fehlandt is beautiful, but there’s no person behind her looks, and the bodice and tutu in which Katherine Fritz dresses her accentuates a solidness that takes away from Consuelo’s attractiveness (given that only Fehlandt’s lovely face, and good figure, if not forced into an unflattering tight costume, can account for anyone becoming enamored of her Consuelo, a politically incorrect sexist comment, yes, but one that is a propos of the production considering Consuelo’s role, thrust into the forefront ahead of He’s, is compromised and rendered damagingly incomplete). Fehlandt’s performance is more indicative of the acting in Bonetti’s production than Beschler’s is. Beschler, Foley, Terry Brennan as a cynical clown, Jackson, and Ben Grinberg, as Bezano, are the only performers who do more with their characters than make them line-spouting fixtures. Oops, I forgot Brian McCann, as Consuelo’s father, a count whose gambling and lasciviousness has decimated his inhertied fortune so much his only way out of a debt that might land him in jail is by giving Consuelo to the baron for a handsome dowry, one from which he stands the chance to have some residue after clearing his obligations. McCann has a lot of presence, but he, who usually impresses with subtlety, plays the count like a stock comedian from a Victorian melodrama. Gestures are big and grand. Dialogue is read with complacent vocal merriment. McCann does not only play a fake. He plays him like someone who is putting on an act. There’s nothing natural or human about the character. Brian McCann, of all local actors, presents a character that is all histrionic bravado with no dimension. He is so overdone, you can’t take him seriously, so you don’t take the sale of Consuelo seriously. The relationship of father and daughter becomes a cartoon, a straightforward plot devise that elicits no strong reaction. All is too baldly presented to have impact. McCann’s count is all slick-haired cavalier braggadocio. You don’t see the count in a sweating panic about facing jail. You don’t see him regretting what he has to do to his daughter or save himself. You don’t even see appreciation for Consuelo’s acquiescence in going along with his scheme. In fact, Consuelo loses points because in Fehlandt’s shallow portrayal, you believe her when she talks about wanting to give up the circus and live in luxury and says she will take the baron for what his money will mean to her comfort and not only to rescue her father from confinement. Except for Bezano, there is not one admirable or laudable character on the PAC stage. The problem is He and Consuelo should also be sympathetic and worth taking an interest in and rooting for. It should break your heart that Consuelo has to refuse He to take the course they both know is best for her, life with Bezano, but Bonetti’s production makes you feel nothing. It shortchanges the main story, fails to make the story it put ahead compelling or believable, and has no narrative or emotional core. For all it’s failing to find a way to tell “He Who Gets Slapped,” Bonetti’s show does have an extraordinary moment or four. The dance between He and the baron is one of them. It’s interesting in concept, bold in execution, and features the two actors who play for keeps in a way that is consistent with and illuminates their characters. Another scene like that, both in intensity and added entertainment value that only nudgingly advances the plot, is one in which Annette Kaplafka, an excellent Ophelia at Hedgerow last season, playing the co-owner of the circus and a rather daring lion tamer, displays her jealousy at Bezano preferring Consuelo by treating him like one of her lions, one that is in particularly need of discipline. She hunts Grinberg’s felinely agile Bezano across the stage, barking orders, cracking her whip, and using a chair for effect. It’s a stunning bit of theater that really does show the passion of Kaplafka’s character, Xena’s, more than just being included for the sake of sensation. Bonetti obviously had some bold ideas that had to take second place to navigating the weird, neglectful architecture of Wykes’s text. Several of the circus tricks were also quite delightful. Grinberg, Brennan, and Totora show a feat of strength that astonishes when professional acrobats do it. Three actors mastering it is quite impressive and worthy of multiple kudos. Totora and Andalyn Young play a pair of ubiquitous clowns who are always around and comment on the action by laughing silently, bedeviling one of the characters as he tries to deliver his dialogue, and making disdainful faces to each other. The bit has its charm but gets tired after a while. If Totoro and Young’s characters, Paulie and Wally were not included, you wouldn’t miss them. Concept and misplaced emphasis get the way of the story here. Doing something creative or different should enhance, not obliterate, the basic tale being told. I had a similar problem with Theodoros Terzopoulos’s “Antigone” for the Wilma this season. “Antigone” at least will have multiple chances to redeem itself. “He Who Gets Slapped” is rarely produced and therefore was an expected treat. Frankly, it was good to have the chance to see it staged. I only wish storytelling has been the guiding impetus and that the major flaw in Wykes’s script, brushing past the clues that inform us about He’s self-punishment, was not compensated for in any shrewd or compelling way. Ross Beschler’s performance is the main reason to celebrate PAC’s production. Beschler has been laudable in a series of supporting roles from his dissipated reporter in InterAct’s “The Dangerous House of Pretty Mbane” to the agnostic boyfriend in the Wilma’s “The Hard Problem.” He marks a breakthrough for him. Beschler has proven he can take a complex, enigmatic role and find ways to make his character’s emotions and intentions known (even if Wykes prevents him from providing some of the most crucial information, exposition that can be acted). Beschler has the pacing and vocal pitch of a star. He can convey He’s melancholy thoughtfulness and his desire to fit in as a liked clown happy to be slapped for amusement. There’s depth to Beschler’s work that, unfortunately, does not transcend to the play. It, however, reveal this actor’s intelligence and command. The hope is it will result in Beschler receiving more lead roles and acting challenges. There is no doubt after “He Who Gets Slapped” he can meet them. Ben Grinberg brought urgency and romantic fervor to his Benzano. You could a performer’s hot temper fused with genuine love for his chosen, Consuelo. Grinberg also impressed in the circus aspects of Bonetti’s staging. His concentration in a moment when he has to balance himself in a hand stand, one hand clasped in Totoro’s (It may have been Brennan’s) palm, was as exhilarating as the feat itself. As an actor, Grinberg showed Bezano’s ardor for Consuelo in ways that make you want her to wound He, who is set up for wounding, to be with him. 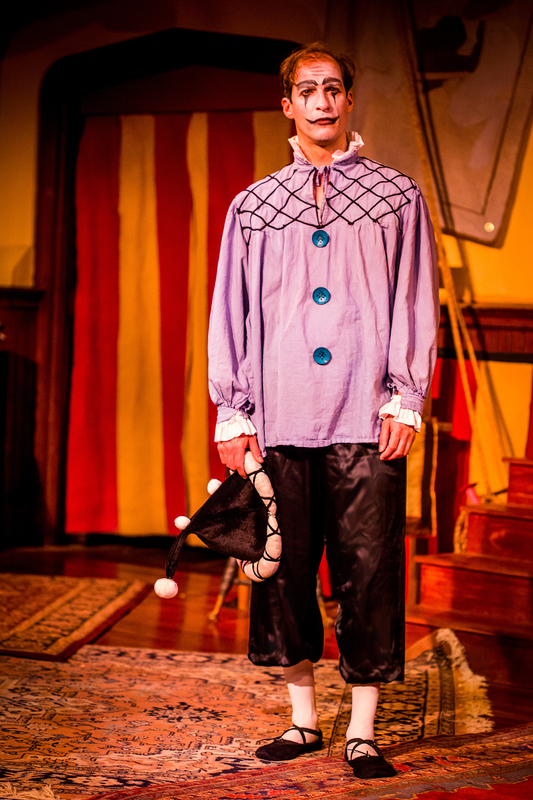 Terry Brennan is the right kind of offbeat as Jackson, the clown who’s been around the circus his whole and can observe any offstage gossip or intrigue with sardonic humor. Brennan entertains and enlightens each time he appears on stage. Nathan Foley is excellent as the baron who maintains his savoir faire and most of his temper when goaded by He and who lets you know his interest in Consuelo is not totally a business arrangement by the way he looks at her. A man the baron’s age might have to obtain a young wife by buying her, but Foley telegraphs his baron means to love Consuelo and treat her well and not just have her an adornment. Annette Kaplafka has some strong moments as Xena. You certainly know where this character stands on business and personal matters. At times, Kaplafka comes on too strong and makes Xena more strident than resolute, more inclined towards vengeance than likely to nurse her wounds and leave well enough alone regarding others. Bob Weick surprisingly endows the circus owner, Papa Briquet, with little dimension. There’s no tone to his voice, and he plays Briquet in an efficient but uninvolving way. 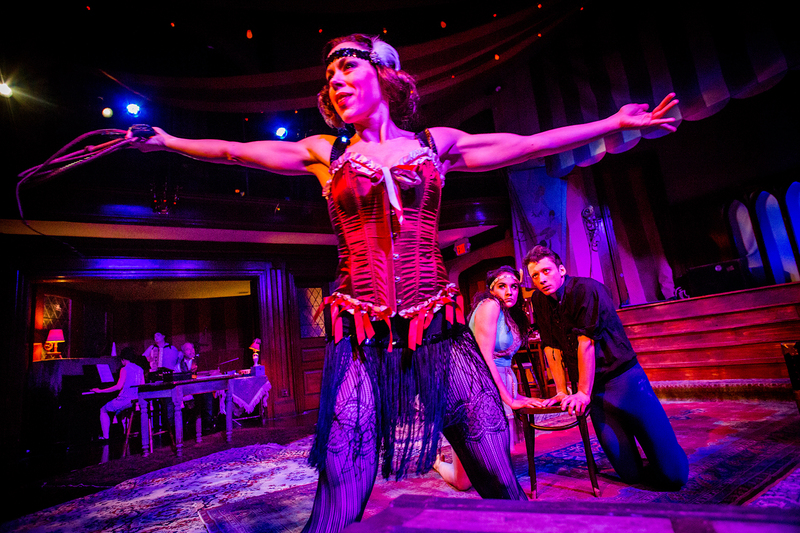 Matthew R. Campbell’s set, festooned with lights, faded striped cloth, and other big top appointments, suited Bonetti’s purpose to provide several performance spaces and to leave enough open room for circus feats. Except for the unflattering choice for Fehlandt’s Consuelo, Katherine Fritz did well in designing circus outfits and Victorian ensembles. Briquet’s ringmaster’s jackets seemed a little worn and dusty, a nice touch. Fritz was especially witty is designed the clown costumes for He. Just as wonderful in that context is the slight, but effectively evocative makeup Jessica DalCanton devised for He. Two long triangles radiate from below his eyes, the base of the figures leading from the eye downward while from the brow features heavier, denser triangles and shadows. They provided illusions of tears and elation. When Beschler wore his clown’s cap and the most involved of DalCanton’s makeup designs, he looked stunning and was able to give He extra texture. The cast, led by Totora, provided the music and worked to evoke Paris by continually playing songs associated with that city, “Sur les toits de Paris” (On the Roofs of Paris) prominent among them. This entry was posted on April 9, 2016 by nzoren in Theater Reviews and tagged 315 S. Broad Street, Andalyn Young, Annette Kaplafka, Ben Grinberg, Bob Weick, Brian McCann, Broad Street Ministry, Damon Bonetti, He Who Gets Slapped, Isabella Fehlandt, Jessica DalCanton, Josh Totora, Katherine Fritz, Leonid Andreyev, Nathan Foley, Philadelphia Artists Collective, Philadelphia Theater, Ross Beschler, Terry Brennan, Walter Wykes.